Our Values act as a compass at the core of our culture and are the documented standards and principles that are central to how things are done. Our five core values are briefly described below. We are open and honest in what we say and what we do. We take responsibility for our work and our actions. We are passionate about achieving success for our clients, our collaborative partners and each other. We provide continued training and education to our staff and strive to continually improve. We are open-minded and share our knowledge and achievements. We work as a team in a cooperative, supportive and friendly environment. We develop long term relationships by earning the respect, trust and support of our customers, partners and each other. We are dependable, take ownership and work for the company as our own. 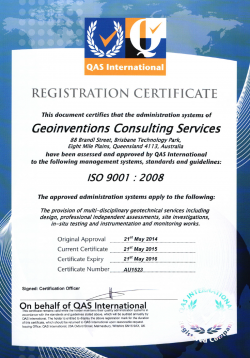 Geoinventions recognises the important role employee’s play in upholding the company’s level of quality and service. We are committed to ensuring all employees are provided training in the requirements of the QMS and receive continual professional development. -Ongoing compliance with the ISO 9001 standard.